I would probably be done with the X-Books if they keep Rachel as a hound or villain. A correct portrayal of Cable should be rescuing Rachel by any means necessary and having her stay with Ahab beyond a few issues is just horrible. Of course saving Rachel doesn't mean she lives, it just means she is saved from Ahab even if it means she dies in the process. I guess we'll see, nothing in the solicits or rumors have her getting free from Ahab so it's impossible to know what will happen. I know there is an upcoming issue where a character is dead on the cover and Cable appears to be grieving, it looks like a male character, but who can say it could easily be Rachel. It looks like a male. I am thinking Cannonball or Deathlok, but covers are always misleading. And no the solicits won't mention her because she's not important enough to the writers or story at this point to warrant her inclusion. And many of us feel the same way about her remaining a hound or villain. Feel free to write to Brisson and White and share your concerns. They many not respond or listen but at least they are hearing it's not cool form people. I really like this art. It reminds me of Art Adams Rachel, especially the costume. The colors are so vibrant without being gaudy. Anyone want to see some interaction between Rachel and Laura? I'd imagine they have quite a bit in common. Last edited by From The Shadows; 02-11-2019 at 03:18 PM. They interacted a little bit in Claremont's Reloaded era, but Laura mostly interacted with Betts during that time. I do think it would be good for them to interact, but I would prefer an actual Hope - Rachel scene (or even X-Man - Rachel scene) before Laura. Yeah, I remember that but it really wasn't anything deep. But the idea of both being treated like animals is something they could probably relate to and as much as Hope should interact with her, its expected but I'd like to see her interact with other characters outside the Pheonix/Grey/Summers thing. I'd like to see her make new friends. What close friends does she really have outside of Kurt and Kitty? Despite her being on the X-Men in the 80s she wasn't all that close with the others. That was one of the things I liked about house of M, Rachel and Psylocke partnered up with Captain Britain and Meggan. 1. On a book with Cable where they act like brother and sister on an ongoing basis. If Cable is the one who rescues Rachel from Ahab I want him to be as serious about getting Rachel back as he was about getting his Dad back. 3. Explore Rachel being the Starchild (daughter of the Phoenix) and what that really means. 4. Rachel and Kitty start dating like a real couple and shock everyone. I'd add Betts and Ororo to that list. Regardless of the fanfic animosity Wood gave them, they have had a close friendship. Other than Cable a lot of these were fleating, don't get me wrong I like these interactions but they should def be brought back and expanded on. But I really want to see a deep bond with someone who hasn't really been done before. I didn't like how the Wolverine/Rachel thing was handled though in Reload. As much as I like Logan I would have liked to have seen her mad at him for stabbing her to save a murderer. Who used violence himself as a last resort. If there was any character that you could justify violence towards it was Selene. Oddly enough I never saw her that close with anyone other than Kitty in those early X-Men days, Amara to a small degree and later Kurt in Excalibur. They used to be rather cruel with her during her flashbacks. And when Logan stabbed her they didn't seem to care what happened to her. I guess my idea of close is a bit different. I mean there was some interaction but was it being truly close? Later it has improved with her and Betsy, of course, as stated. Unless this happened in X-Treme which I only read sporadically. Then, I could have missed stuff, it's quite possible. Last edited by From The Shadows; 02-12-2019 at 05:03 PM. Other than Cable a lot of these were fleating, don't get me wrong I like these interactions but they should def be brought back and expanded on. But I really want to see a deep bond with someone who hasn't really been done before. I didn't like how the Wolverine/Rachel thing was handled though in Reload. As much as I like Logan I would have liked to have seen her mad at him for stabbing her to save a murderer. Who used violence himself as a last resort. If there was any character that you could justify violence towards it was Selene. Oddly enough I never so her that close with anyone other than Kitty in those early X-Men days, Amara to a small degree and later Kurt in Excalibur. They used to be rather cruel with her during her flashbacks. And when Logan stabbed her they didn't seem to care what happened to her. I guess my idea of close is a bit different. I mean there was some interaction but was it being truly close? Later it was improved upon with Betsy as stated. Unless this happened in X-Treme which I only read sporadically. Of course I could have missed stuff, it's quite possible. Rachel's the first recruit of what I call the "second wave" X-Men. Shadowcat replaced Phoenix, and Rogue somewhat replaced Cyclops. The team of Storm, Nightcrawler, Colossus, Wolverine, Kitty Pryde and Rogue is the roster Claremont really hit his stride and explored the cast as both individuals and relationships. When Rachel was introduced, it was the start of Claremont beginning to cross-pollinate the X-Men book with wackier and wackier concepts. First was Rachel Summers, from the successful DOFP storyline. Then Longshot from Mojoverse, which always struck me as an uncomfortable parody of MTV and rabid entertainment culture. Psylocke, an exchange from Marvel UK's strange world. Dazzler, from the greater Marvel Universe of heroes. While Dazzler has a career, Longshot a dimension, and Psylocke a substantial inheritance, Rachel is the only one who doesn't have anywhere to really "go" when writers want to hit the reset button with the X-Men. That's why Rachel gets unsympathetically kidnapped to Mojoverse, scuttled to Europe, sent to the far future, put in college, and now off with Ahab. I've gone on at length about how I see Rachel as less of a recruit -even "second wave" -and more of a character-study-as-response to the first two chapters of X-Men stories (O5 and ANAD). I think she belongs with the Claremont stride team, and relationships explored there. And while I do think she should pursue a romantic relationship with one of them, it shouldn't be Nightcrawler... or Kitty. Rachel that college chica from the Youtube comments who says she was born in the wrong generation except she's literally right. It's interesting because it'd true in a sense. Rachel appears and is taken into the X-Men. Because of her relationship to them (well her relationship to her world's version of them) she has difficulty confiding, holding back her emotions, and relating to people. As they are ghosts to her. Looking back at those issues, how many times did Rachel seem to cower or prove useless due to her trauma of her past especially when being asked to search for people telepathically? A lot. But she was traumatized and didn't let anyone in. 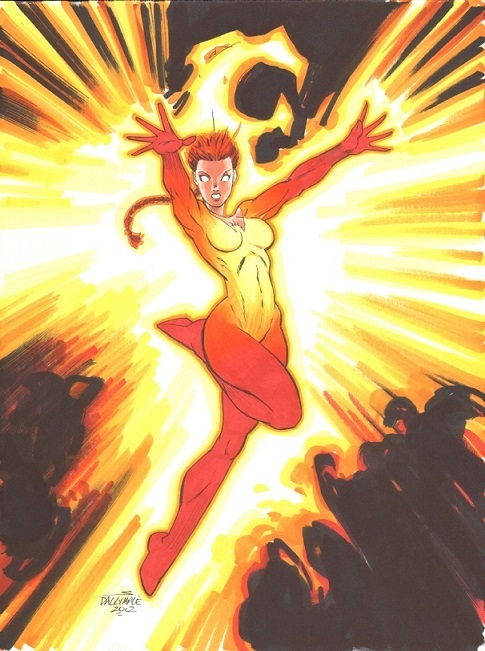 She was seen as (and in some ways was) ineffective or unreliable until she became Phoenix. I mean I love the "No more lousy tears" line Rogue gave her, but it's how many of them saw her. Then shortly after that the Secret Wars happens and she makes a decision in regards to her teammates and the world about fighting the Beyonder. She gets talked down, but loses the trust of her team, and then being linked with Wolverine and him being hurt, she gets blamed even moreso. So by the time she's stabbed by Wolverine and bleeding out, do the X-Men decide "huh, maybe we shouldn't have been so hard on this 17 yo who has a lot of trauma". I mean the only relatable person for her was Magneto at that point given their similar histories. She's she's written out, was going to get a mini before Excalibur but it got canned. Out of sight out of mind until Excalibur. And eventually Claremont makes her bff's with Kitty and Kurt. So to state that again, when she's out of sight - she's out of mind. This current predicament of hers - enslaved to Ahab again - it's not the first time that she has been enslaved while being on the X-Men (clearly). But it is now the SECOND time that she's been enslaved or removed from the picture due to trauma (enslavement) or injury and NO ONE GIVES A *&^%. It's literally history repeating itself. Watch, she's going to reappear in X-Force and people will be like, "Oh yeah, I forgot about her. So that's why she's not around..."
The clustering of set teams has been a problem in general over the last couple years.